Pretty soon it will be time to start showing you lots of Valentine cards....but today I thought I would just share a simple generic card. One of my favorite designers is Lori Boyd. She creates the most adorable digi stamps. Be sure to check her blog out right here. 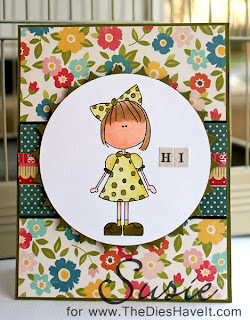 I used Spellbinders dies for my focal image and mat. I just love the simplicity of using these two die sets together. Be sure to come back tomorrow. I will have a One Buck Wednesday layout to show you. This is a cutie. :) Looking forward to the valentine's day cards.